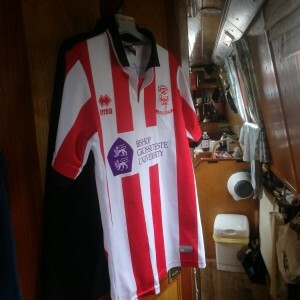 Narrowboating Chick | An Epic Journey. Today we knew that we would have to cover some ground if we were to stand any chance of getting back to the Marina by Monday afternoon. We set off at 7am and it was a perfect boating day. The canal was almost ours. We think that any souls around that early on a Sunday morning, by definition, surely must have a cheerful disposition and today was no exception. We had a pleasant chat with the people from NB Into The Blue halfway down the Curdworth flight and passed another boat near the bottom. From the Curdworth Bottom Lock, it was time to indulge in Boaters Sustenance, otherwise known as bacon & egg sarnies, which Chef Marcus prepared whilst we were still on the move and I gallantly ate whilst steering. All quiet and gentle on the B&F and then we hit the Coventry, which is where it started to get tedious, not just because of the lack of locks, but many, many moored boats, boats in front, boats behind and boats coming in the opposite direction. I know we were there too, adding to the congestion, but it was certainly a busy stretch of water. I like to pass boats, nod & smile and check out their paintwork, name & shape etc and I know I am now being contradictory, but it was also a small pain in the backside. Quite excited to NB Lola coming towards me and just had time for a quick shout out to say that I was following their blog. It’s a small waterways, isn’t it? We then cruised steadily until 6.30 and we felt that enough was enough and 27 miles in one day was enough and we stopped just short of Colwich Lock and enjoyed the blissful peace and quiet. The lack of light pollution meant that we were able to have the curtains open (canal side, of course!!) in evening and enjoy what was left of nature’s light.We hit Fradley Junction at 3.30pm and apart from there being lots of people, was not too clogged up with boats and we got through nicely. As my husband remarked, in all seriousness, after we’d got through “we didn’t do too badly at Fradley”…hehehe! We’ll it tickled me, anyway.